An increasing number of landed immigrants are struggling to complete the final stage in becoming a citizen: passing the citizenship exam, CBC News has learned. That has the federal department responsible for the tests promising quicker do-overs. An increasing number of landed immigrants are struggling to complete the final stage before becoming citizens: passing the citizenship exam. The failure rates have increased significantly since Citizenship and Immigration Canada introduced new and harder tests last year on March 28 and July 23. According to statistics obtained through the Access to Information Act and released to CBC News Network's Power & Politics, the hardest hit are individuals in the "family class" who, according to the department's analysis, typically have lower levels of education. Citizenship and Immigration and the Historica-Dominion Institute host an annual Canadian Citizenship Challenge for high school students, which asks them to answer questions similar to those on a citizenship test to see how well they do. Take a look at last year's test here. For instance, individuals with a bachelor's degree saw their pass rate decrease from 95 per cent to 87 per cent, while individuals with a high school education or less, saw their pass rate descend from 70 per cent to 55 per cent. According to the department's internal analysis contained in the material released to CBC News, most individuals in the economic class, a group the federal and provincial government have been courting, have high levels of education. By contrast, family class members — mothers, fathers, children and grandparents of recent immigrants — are not required to have as much education. They're mainly coming to Canada to join families, not to help stimulate the economy, a key criterion of the individuals in the economic class. Recognizing that it has a problem on its hands, the department is attempting to find solutions. In the same internal analysis, the department says it is "actively working to address this performance gap among various immigration groups." However, the analysis neglects to specify any concrete measures to achieve this goal. On June 3, the minister issued a news release pledging to allow people to rewrite the test within "weeks" rather than the several months to two years that immigration lawyers tell CBC News it has typically taken for the retests. 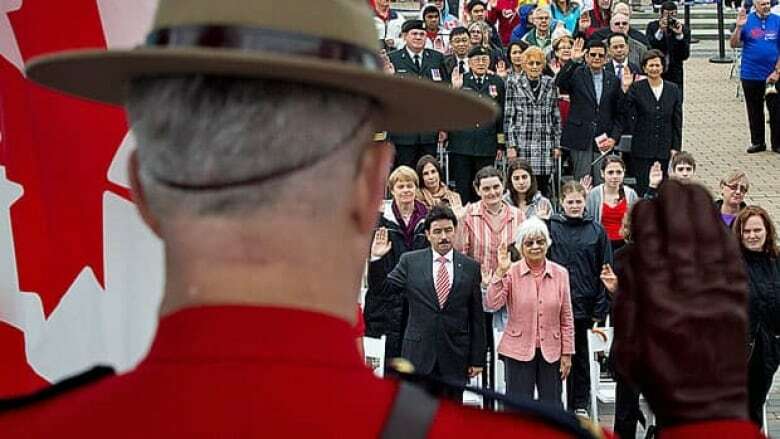 "The Government of Canada remains committed to maintaining Canada's tradition of high numbers of permanent residents taking up full citizenship, and this is one of many recent improvements that have been made to the citizenship process to ensure the timely welcoming of new citizens," said Immigration Minister Jason Kenney. In a follow-up email to CBC News, spokesperson Whitney Punchak wrote the government has a responsibility to ensure potential citizens have met all of the necessary requirements for citizenship, including knowledge of Canada. "The citizenship test assesses how well applicants understand Canadian values and what it means to be Canadian. The test questions are based on the content in the new study guide, Discover Canada, including a broader focus on Canada's history, identity and values. Our aim is for new citizens to learn and understand the concepts presented in this guide." The increasing failure rates come as no surprise to immigration lawyer Stephen Green, who says the tests, which are not made public due to concerns about cheating, are too "convoluted" and "poorly written." "If you were to ask someone, 'Who's the prime minister of Canada?,' you would know the answer right away. "[A question on the test] would ask, for example, 'Who is in charge of the head of the party in power, and what's his title?' In my opinion, they've crafted the test in a very poor way. People know the answers, but the questions are asked convolutedly," says Green. "What happens is this: You write the test, you fail. If you fail the test, they schedule you for a retake in six to eight weeks," Green said. "I've seen the test… And I'm sitting there scratching my head. It's not a clear exam question." Perhaps this is why the department's internal document stresses the need to address the "performance gaps." Though the analysis provided few details, it did refer to providing more money for "five citizenship preparation projects developed by settlement organizations. These initiatives are aimed at providing newcomers with the knowledge to prepare for citizenship and might help them better prepare for the citizenship test." But the onus is also on people taking the tests, says immigration lawyer Richard Kurland, who obtained the internal documents. For instance, they can study questions at a government site called Discover Canada. "People have to take this test more seriously and study harder. It's a challenge if English isn't your first language. It's a challenge if you went almost as far as high school in terms of education. In order to access that citizenship, you've got to bite the bullet and take this test seriously, get help from community groups that have suddenly sprung forward offering assistance and training people to help pass those examinations." Kurland and Green also emphasized that these revised tests seemed to come out of nowhere. Both lament the absence of consultation. "All of this is done behind the wizard's curtain," Kurland said. "It's a non-disclosed item. There was no indication in advance that there would be tougher questions on the horizon. There was no consultation with any stake holder outside government regarding the formulation of these questions. "Were there focus groups to test the questions?" he said. "Did the government know in advance that the outcome would be as it was, a spiked failure rate? Maybe yes, maybe no. No one's telling."